The Cinque Terre is one of my favorite places in the world for photography. 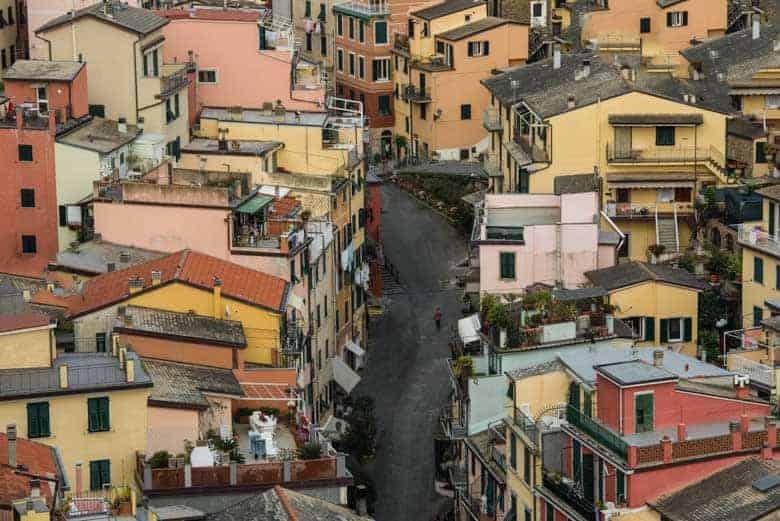 From excellent sweeping landscapes of the colorful homes spilling all over the cliff tops above the ocean to beautiful street photography opportunities, the Cinque Terre is an excellent location for photographers. I've just been in the Cinque Terre (five lands) for the last few days, and so I'd like to share a few tips and locations that I particularly liked. First, you need to choose a city to stay in. It may not matter too much which city you pick, because there are regular trains passing people between the five cities, and there is a popular hiking trail that allows you to walk between them. The cities are very close geographically–you can see the last city from the first one. If you get the “Terre Pass” for just a few euros, you can take the train, bus, and use public restrooms all day long. IMPORTANT TIP! Since publishing this article, we created the ULTIMATE tool for planning a photography trip to Cinque Terra. It's called Really Good Photo Spots. 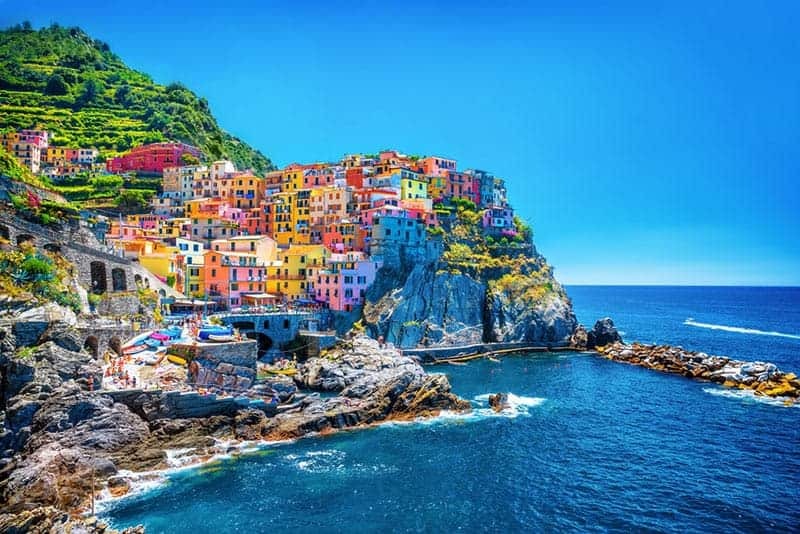 It's a free iPhone and iPad app with THOUSANDS of the best photo locations in the world all in one app, and Cinque Terra and Tuscany especially are well covered in the app. It's really convenient for travel photography because you can just tap “Spots near me” and BOOM! It lists all the best spots to take pictures near you. Download really Good Photo Spots for the iPhone or iPad right here. 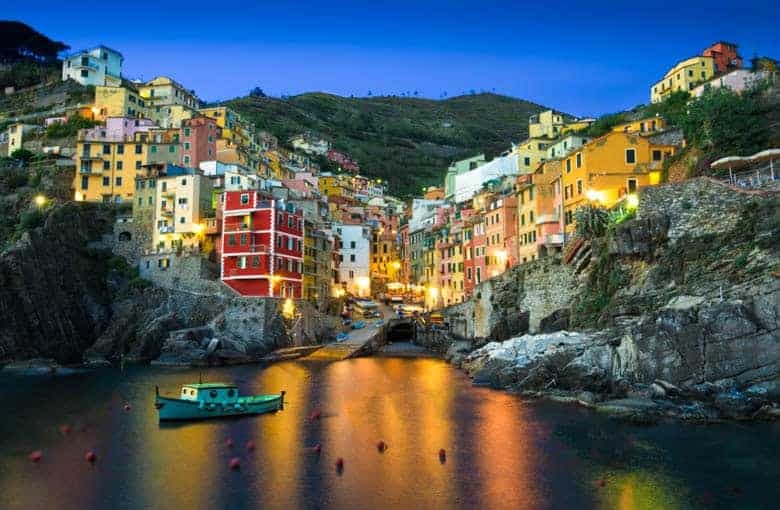 #1 Riomaggiore – Most photographers pick Manarola as their home base for photographing the Cinque Terre. It's the postcard shot that you've seen all over. However, I personally prefer the look of Riomaggiore for the wide sweeping shot of the city in blue hour light. Riomaggiore has a large rock outcropping in the bay. As long as you're reasonably light on your feet, you can easily climb out on the rocks in the bay and have a perfect view of the city. If you're less nimble, there is a closer spot on the rocks with stairs going down to it for a decent view as well. Aside from the wide sweeping shot, you'll also find lots of “detail” shots of the colorful homes and street photos in Riomaggiore. All of the cities in the Cinque Terre are photogenic, but as a professional photographer, this is the one that won most of my attention. #2 Manarola – Manarola is the postcard shot that probably made you decide to come to the Cinque Terre in the first place. It's a beautiful shot because it shows the homes more straight on and the homes spilling over the edge of the cliff. One caution about staying in Manarola is that this postcard shot is difficult or impossible to access if the hiking trail is closed. There are very frequent landslides in this area that can shut down the entire hiking trail and thus ruin your ability to get this shot. Be sure the trail is open if you want to get this shot. It was closed when I visited. #3 Vernazza – Vernazza is another excellent photography location for photographing the Cinque Terre and is my third pick. Vernazza is an interesting photo because it adds the dimension of a large cathedral near the edge of the city. However, the side of the cathedral looks more like a flat face of concrete, and some photographers may not enjoy the look of the city as well for that reason. The “Other” Cities – All of the Cinque Terre is beautiful and you can certainly make great photos in all of them. But if you are picking where to make your home base, I'd stick with Vernazza, Manarola, or (my personal favorite) Riomaggiore. You'll have no trouble when you're there taking a train to the other cities to visit as well. Tip on Picking a Hotel for Photographers – The only trouble is that photographers need to find a hotel right in the downtown area of one of the cities. If you are in one of the many “agritourismos” outside the city, you won't be able to shoot the city in evening light. The last bus leaves at 8:05, which is before sunset. If you've already booked a hotel outside the city, you're not totally out of luck. The trains run until after midnight, so you can shoot late in the city center and then take a train out of your city to La Spezia (5 minute train ride) and then get a taxi back to your hotel, which costs about 35 euros. There are no taxis in the Cinque Terre itself. If you climb to the top of the castle overlooking Riomaggiore (Don't worry, you can't miss it. Just look up and you'll see it on the top of the hill), there is a perfect overlook over the entire city. This is a great spot for not only getting photos of a few of the houses clumped up and filling the frame, but also for shooting the bend in the main street as it winds up the hill. This is a really neat shot of the Cinque Terre, and while it's not the classic postcard shot showing the ocean, I think it shows off the uniqueness of the location well. The castle is open until very late and you can just walk right in. There is no entrance fee. You'll want a lens of about 135mm on a full frame camera for this shot. Tip #1: If you want the classic sweeping shot of the Cinque Terre, you have to shoot late. You'll see other photographers shooting at sunset and slowly they'll all filter out and leave as it gets past sunset. Hold your ground! The very best lighting for the Cinque Terre is during the blue hour after sunset. You're waiting until the rich blue sky matches the brightness level of the city lights. Once the sky looks a rich blue and is dark enough to not be the brightest part of the photo, you're at the perfect moment to capture your shot. You can see that on my photo of Riomaggiore at the top of this post. Hold on for the best light! Tip #2: Bring a tripod! When you're traveling it's understandable to not want to bring a tripod, but if you'll be shooting into the blue hour, you need a tripod to get a steady shot. If you won't be needing a tripod for other shots while you're in italy, you could actually get away with just bringing a little gorillapod in this instance because you can set up the gorillapod on the rocks out in the bay and it'll be plenty high enough. Tip #3: Look up! The older Italian women in Italy love to people watch. Keep your eyes peeled for women looking out their beautiful windows on the streets below. It's an excellent photo opportunity! Tip #4: Bring a good all-around lens. If I had this trip to do over again, I would have brought a good wide angle lens, and then an all-purpose lens for the street photography stuff. A Canon 24-105mm lens would be PERFECT for this, and then you only have to carry around two lenses for the whole trip. It covers such a broad focal length and is such a sharp L lens that it's meant for travel. Tip #5: Don't skip out on the daytime shots. It can be tempting to become a “light snob” as a photographer and to skip out on photographing during the day until the light is perfect at night. Don't make that mistake in the Cinque Terre. The bright daytime sun turns the water of the ocean into an incredible, vibrant bluish green and contrasts well against the color of the houses on the cliffs. A few daytime shots in this location are warranted as well. Tip #6: Don't underestimate travel time and don't drive! It's true that there is parking in the Cinque Terre at the top of the cities, but I would strongly discourage driving. Parking spots are extremely limited and the few American tourists we talked to who parked there got large parking fines for misunderstanding the very complicated parking rules. Taking the train to the Cinque Terre is really the best bet. It's fast, easy, and inexpensive. There is no driving in any of the cities, so a car is really just dead weight while you're there. We flew into Milan, and it did take quite a bit of time to get to the Cinque Terre. We arrived in Milan at 9AM and didn't get to Riomaggiore until about 4PM. It's a big travel day to get to the Cinque Terre because of their somewhat remote location, but I do believe trains are best for most travelers.